Dear readers, I invite you to take a moment from your busy day procrastinating from your increasingly pressing responsibilities to indulge in a meditative exercise. Clear your mind. Continue to breathe as you have been since birth. Picture a white space. Imagine in that space a clear cup before you, bobbing in the friendly manner that cups do. We’re going to fill the bottom-third of that cup with delicious, chewy tapioca pearls. (What’s a tapioca pearl? It’s a piece of happiness you can eat.) Next, we’ll add some ice, clink, clink, and your favorite tea. Add to that a bit of milk and honey, and we’ve got some bubble tea! Two sweet, enticing glasses of Kung Fu Tea’s bubble tea. Photo courtesy Kung Fu Tea. Bubble tea, boba tea, or 珍珠奶茶, is a popular tea-based drink, which originated in Taiwan during the 1980s. Over the past ten years, the popularity of this tasty beverage has skyrocketed and bubble tea shops have spread out from the island of Taiwan across the world. Bubble tea can be easily recognized by its distinctive tapioca balls, which rest gently at the bottom of the drink like friendly black pearls. Drinks can be grouped into three broad categories: (1) Classic tea-based flavors, such as jasmine, green, or black tea; (2) Flavored teas, which range from familiar (strawberry, mango, grape, etc.) to slightly more adventurous (lychee, guava, taro); and (3), slushie/smoothie blends, which are thicker and include flavors like Oreo, chocolate, and mocha. Aside from tapioca, other popular toppings include pudding, aloe, jelly, and red bean. There are two competing theories about the origin of the name “bubble tea.” The first theory is that the name refers to the tiny air-bubbles that form when the drink is shaken to mix its contents. The other theory is that “bubble” refers to the tapioca pearls at the bottom of the container. In Taiwan, there is a bubble tea shop around every street corner. Here in Charlottesville, we’ve worked hard to find a couple of places where you can get your bubble-tea fix when the mood strikes. Remember, when the gunning gets tough, the tough get bubble tea. Pros: Kung Fu Tea is the place to go for bubble tea! This franchise started in New York and has not lost traction as it expanded southward. With an incredible selection of flavors and toppings, this shop is your one-stop pick-me-up for that midweek hump. Not only can you select your own toppings, you can also adjust the ice and sugar levels in your drink to your own liking. The inside of the shop is trendy and inviting, featuring comfy sofas and board games for use. It’s a great place to go with friends and play a game of Taboo or Codename. Kung Fu Tea also has an app, which you can scan when you check out for special promotions and free drinks. 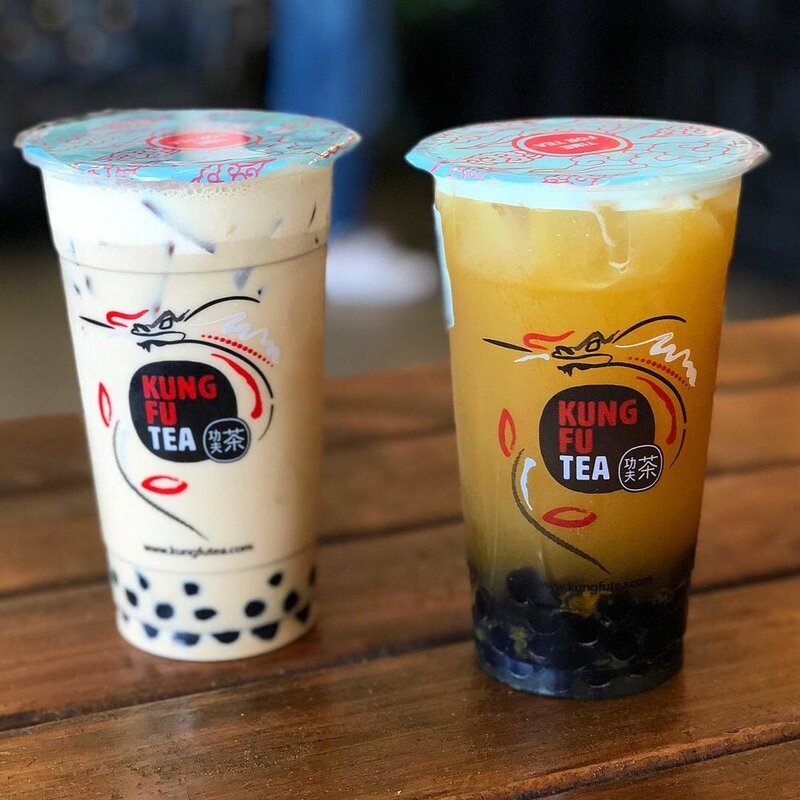 The sheer array of drink options can be overwhelming, but you can’t go wrong with the basics like Kung Fu Milk Tea, or anything off of their Top 10 Drinks Menu. Cons: Since this shop specializes in bubble tea, there isn’t a large selection of food options. The limited menu, which includes pork buns, shumai, and potstickers, is reasonably priced and pretty good. Although Kung Fu Tea is available for Grubhub delivery, they do occasionally mix up an order, which can be really disappointing at 10 p.m.
Pros: Got Dumplings? sells dumplings, ramen, and other drool-worthy Asian snacks. This means that with just one trip inside, you can get a meal and bubble tea. The tea menu is extensive and contains traditional milk teas, fruit teas, and slushies. The bubble tea comes only in large, which means you don’t need to feel guilty about getting the bigger size. The flavor of the tea also tends to be milder, which may be good for a first time bubble-tea drinker. Cons: The store is located on The Corner, which makes parking difficult. There is a parking garage on Wertland Street off of 14th Street NW. Got Dumplings? is on the small side and gets busy during lunch. Additionally, the quality of your drink depends on who makes it, so consistency leaves something to be desired. Overall, Got Dumplings? Is an amazing place for dumplings and noodles, but we’d recommend elsewhere if you’re looking specifically for a good cup of tea.